as well as POP members. Among the issues the campaign will address are a need for a national jobs program, a call to end military actions in Iraq, Afghanistan and Libya, a call to stand against police brutality, a call to preserve workers rights and collective bargaining, a call for a moratorium on foreclosures, a call for national health care and for affordable higher education, and more. POP is calling on a broad range of organizations to endorse and participate in the campaign. This is in an effort to contribute to the forging of a progressive united front for social justice for this area. This is a bold and audacious effort in this period, but the response from motorist driving past the Court House shows without a doubt that the campaign reflects the sentiment of the community. Other organizations are beginning to commit themselves to participation. 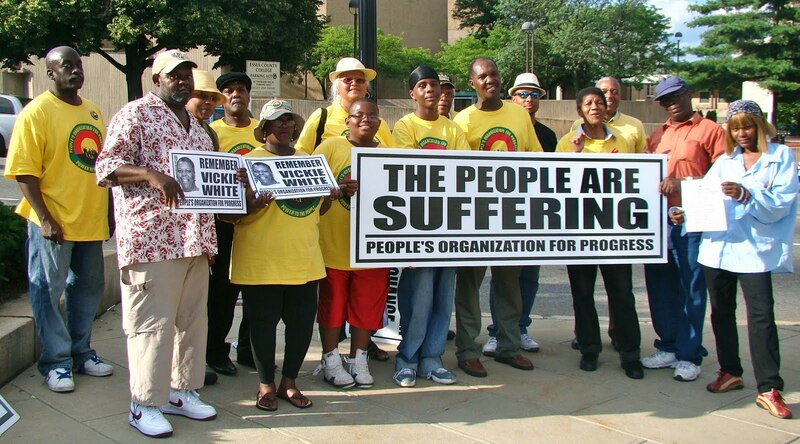 This past weekend, members on NJ Chapter-21 of Veterans for Peace responded excitedly to a call to join the daily pickets in front of the Lincoln Monument at the intersection of Springfield Avenue & West Market Street. Michael McPhearson, a longtime POP member and former Executive Director of the national Veterans For Peace, interviewed Chairman Hamm about this campaign (click on the video image above or the linked "INTERVIEW" before the parenthesis to watch video). The daily actions continue daily from 4:30p.m. to 6:00p.m. at West Market Street and Springfield Avenue, near the Lincoln Monument and will take place their everyday for an indefinite period of time. 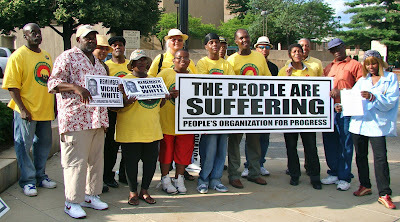 On Saturdays the actions take place from 12noon to 2:00p.m on corner of Broad and Market Streets in Newark. On Sundays the action is from 2:00p.m. to 3:00p.m. back on West Market Street and Springfield Avenue, near the Lincoln Monument. For more information, please call (973) 801-0001. "Boy, things just seem to be getting worse, and everybody's too bummed to do anything..."
Jersey's own People's Organization for Progress is in week three of a campaign of daily demos to assert our interests as opposed to those of the bankers and their pet politicians. Check it out, and if you are within striking distance of Newark show up for a shift or two!